Before Jesus came to Earth as one of us, He was in Heaven as God. Satan, Lucifer, was a high ranking Angelic being. He knew Jesus as God. When Jesus came to Earth as a human, I do not believe Satan was totally convinced that He had become totally human. 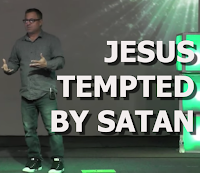 I think Satan was tempting Jesus to see if Jesus truly became human because God cannot be tempted.